Ofcom today announced a major reform with regard to the way people leave one mobile telecoms company and (optionally) begin with another. It sounds like great news for customers; with less friction involved in the process, and service overlap charges eliminated. Unfortunately the changes will take 18 months from now to come into effect. In its background research Ofcom found that 38 per cent of mobile switchers (2.5 million people) experienced at least one major difficulty in changing mobile service provider. Seven in ten encountered at least some difficulty. Of all the observed hurdles to an easy transfer, the greatest is probably having to speak to your current provider to instigate a change. Mobile telecoms companies usually send customers through various departments trying to convince them to stay before providing the requested PAC (porting authorisation code), needed to move your number to another provider and simultaneously end a contract, for example. Instead of calling the mobile provider and having to spend time listening to counter offers, and even special retentions department offers, Ofcom says people will be able instead to ‘text to switch’. See the diagram below to see how it will work. Ofcom understands that the changes will require mobile telecoms companies to make a number of changes to their systems, billing, text and internet form systems, and co-ordinate with each other about 'instant' future switches etc - so has given the industry an 18 month implementation period. 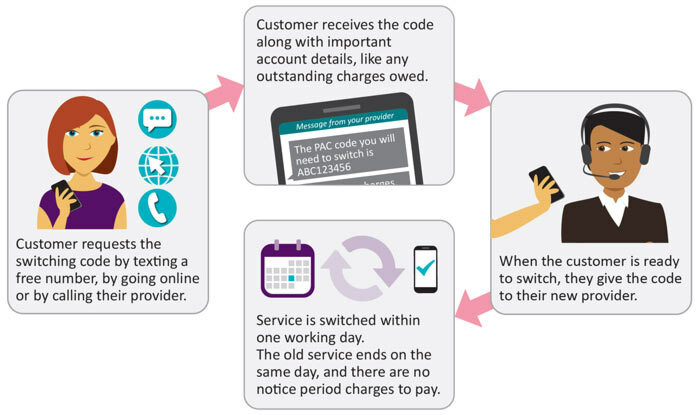 When the new method is implemented customers will immediately receive a PAC or cancellation code on request (via text, internet, or phone). Switching codes will be valid for 30 days after receipt.